As the Phillies head to their second World Series appearance in as many years, Temple and Philadelphia Police announce a zero-tolerance policy. 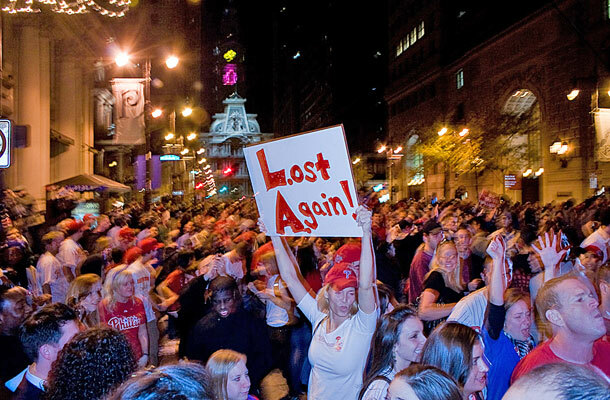 WALBERT YOUNG TTN Celebratory crowds gather in Center City to celebrate this year’s Phillies NLCS win. Rob Lipson, a self-proclaimed Phillies fan, said he’s watched YouTube videos showing much worse celebratory damage than Philadelphia saw following last year’s World Series win. Last year, Center City near City Hall experienced looting, broken windows, downed streetlight poles and other forms of vandalism. Bittenbender said the police want students to have fun but to party safely, adding that Main Campus had very few problems last year, save a few damaged cars when the Phillies won the National League Championship Series. Philadelphia Police Department spokeswoman Officer Jillian Russell confirmed that the Philadelphia Police will be employing a zero-tolerance policy citywide, but declined to comment further. When the Phillies won the NLCS last week, students gathered outside on Liacouras Walk, and people celebrated on South Broad Street with no reported incidents. “Honestly, you’ve gotta do what you’ve gotta do,” junior psychology major Todd Parham said of the police’s zero-tolerance policy, citing that the city doesn’t have much money to repair anything that may be damaged by rowdy, celebrating crowds. But, Parham said, the celebrations could boost the morale of the city. Morgan Zalot can be reached at morgan.zalot@temple.edu. Wednesday’s win ended a 25 year drought for Philly sports.